What a year it has been for my writing. 2012 was great but 2013 I feel I shot forward leaps and bounds, releasing many different books as well as being in print by differing publications . 2013 has been an incredible year for me. It has seen Reads Volume 3 get published with mine and Staticgirl’s story, Gifted, apart of the collection, I have released my own collection of short stories known as The Mind Palace that received critical acclaim and saw me sell out of all of my issues at Glasgow Comic Con leaving only a select few shops with issues. Then at Glasgow Comic Con I released iHero, mine and Graeme Kennedy’s limited superhero series that looks at the question what would happen if you could get superpowers like apps through your smart phone or tablet. We released issue 1 and like The Mind Palace it has received both critical and commercial acclaim with another two issues in the works. Later this year Tales of a Lonely Planet will be released; an anthology put together by Stu Perrins where all the proceeds will go to Cancer Research. 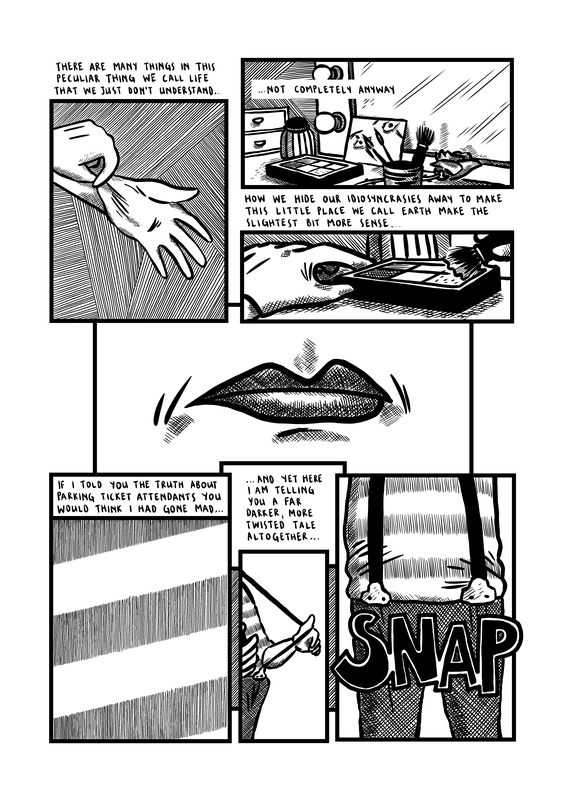 Mine and Tim Bird’s story The Terrible Truth About Mimes will be featured. Now I can announce that I will be apart of a further project. This time working with Watercloset Press on their third issue of Ladies and Gentlemen. I have created the character The Tattie Bogle. Gavin Pollock was on artist duty and I can say that he truly nailed it. Ladies and Gentlemen issue 3 sees various creators come together to tell tales in the Ladies and Gentlemen universe. They could have used the characters that already exist or create new ones. I decided to create new ones with the main villain being The Tattie Bogle as our hero, Edinburgh based lecturer, Doctor Ferguson Flaming investigates. To find out more about Watercloset Press make sure to check out their website. At Glasgow Comic Con, I will be unveiling my newest comic, iHero. iHero came about around a year ago when me and co-creator/artist Graeme Kennedy met up to discuss working together. It naturally evolved through the meeting where we spent a good couple of hours discussing all the various characters and plots. This was the first time that I had ever met up with an artist before writing the script and I loved it. This book is a true labour of love that is such a collaboration. After that meeting I went home and wrote the first script. After we both tweaked the script it was time for Graeme to shine with some amazing artwork. Graeme is a fantastic artist and a great colourist too. I see him as the Scottish Jack Kirby. The speed he works is incredible! Finally good friend Gary Chudleigh has come in and lettered the book. I hope you enjoy the book as much as we enjoyed creating it. You can check out more about iHero through the OR Comics website. At last year’s Glasgow Comic Con I had an idea. I wanted to try and do something that would be adventurous, hopefully innovative and a hell of a lot of fun. So I decided I would put a collection of short stories all written by myself with a variety of different artists coming together to be showcased in one book. The theme: whatever was in my head when I was writing the stories. I have loved putting this collection together. 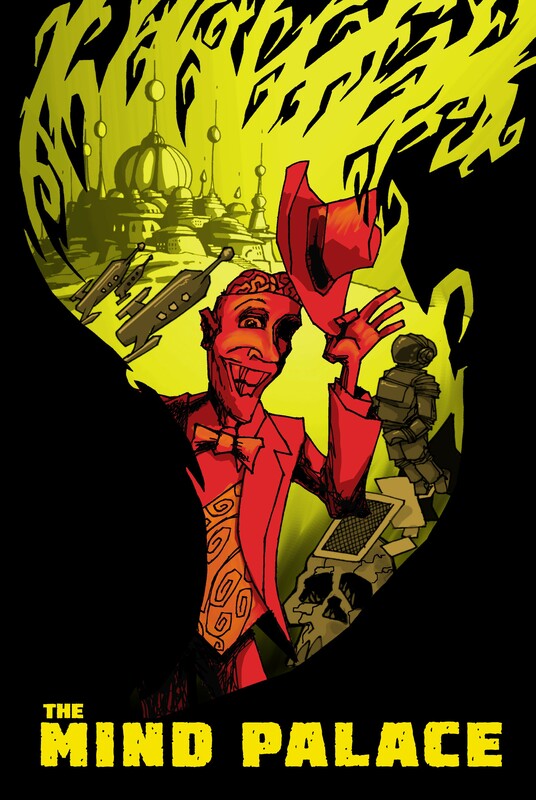 The Mind Palace is a collection of short stories that I have written myself, illustrated by a variety of different talented artists: Cuttlefish, Sofi Hjalmarsson, Rex Kennedy, James Cocoran, and Jamie Wright. 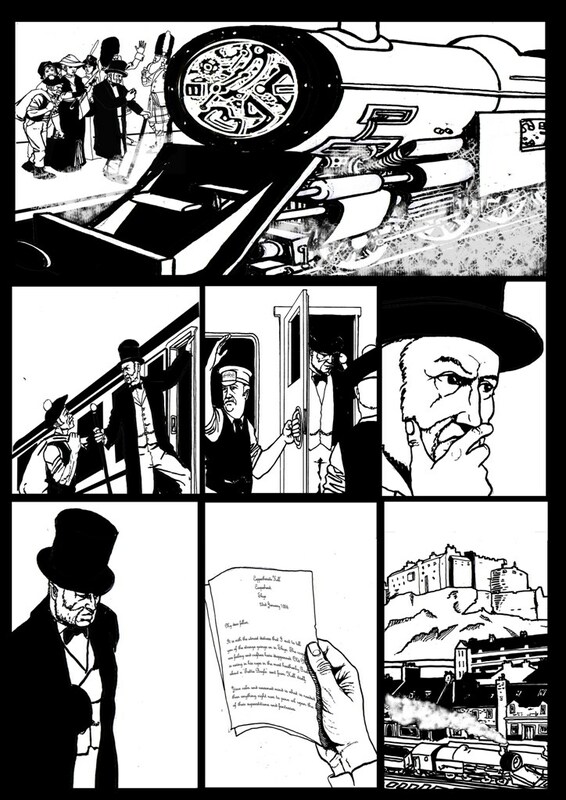 Also big thanks must go to Gary ‘Chudders’ Chudleigh who has put the book together and lettered the script 2.8 by myself and drawn by James Cocoran. The Mind Palace has no particular genre ranging from everything you can think of: from zombie, horror, to sci-fi etc. Tick Tock by me and drawn by Sofi Hjalmarsson. I think you have to see this one to truly get it. The Defender by me and drawn by Rex Kennedy. This is the start of a huge sci-fi opera with what I hope is a great twist and a slice of Britishness to it. I am hoping that this is the start of a bigger story. 2.8 by me, drawn by James Cocoran lettered by Gary Chudleigh. Me and James worked together on GLoW 1 on The Healer. This time we are taking on horror, zombies in what I hope is quite a unique story. Chudders letters are also incredible and I think bring something extra to the story. Martian by me and Jamie Wright. A sci-fi, modern day thriller. A big thanks must go to Chudders who is putting the book together as we speak and I for one (like everyone who has been apart of this book) has really brought his A game. The next project I am apart of this year is something called Tales From a Lonely Planet. This has been put together by Stu Perrins. 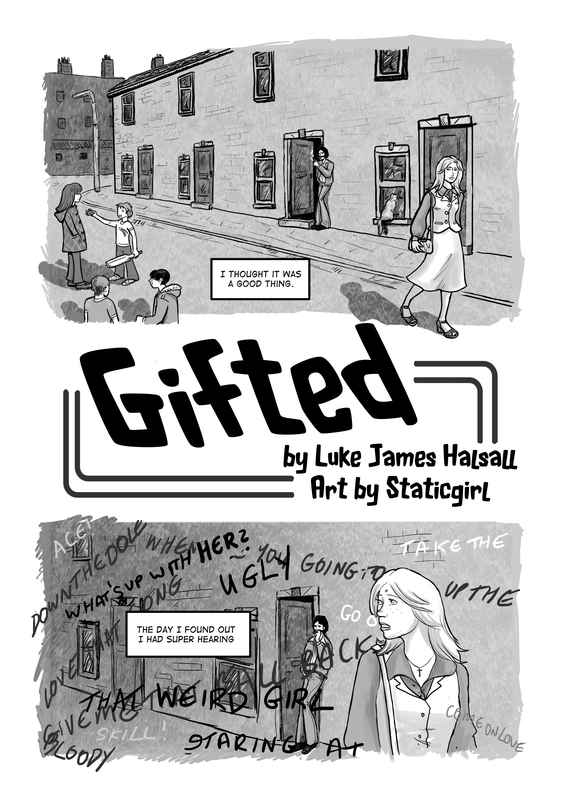 It is an e-anthology of comic strips where all money raised will go to Cancer Research UK. I think this is a great charity and really proud to be working on it. I am also really proud to be working with Tim Bird, a creator I have been a fan of for some time. When writing this strip I was heavily influenced by the great work of one Douglas Adams. Please like the Facebook page and I hope you will consider looking at the anthology. This year I am going to be apart of a lot of interesting projects. So I thought I would start by telling all you lucky people about them. The first thing I will be apart of will be Reads Volume 3 by Avery Hill Publishing. Reads is one of my favourite anthologies out there and I am truly honoured to be apart of this collection. Reads Volume 3 will be out in the coming months and I hope you all enjoy mine and Staticgirl’s story.